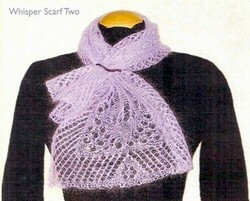 The Whisper Scarves are soft wisps inspired by Orenburg lace patterns. The traditional designs include "peas," "diagonals," "fish eyes," and "strawberries." Scarf 1 is an unusual oval shape, and Scarf 2 is a rectangle. Each scarf has finished measurements of about 15" wide by 38-41" long. Each scarf takes about 270 yards of laceweight yarn. Ovation or Kidlin are both good for these scarves.